Make this delicious easy caramel recipe for all your fall holiday dessert recipes! This is the easiest caramel recipe I’ve ever used! Easily a homestead favorite! With this giant apple influx, I needed more caramel than I could keep up with for all the fall dessert recipes I’ve been making. This easy caramel recipe has made my life infinitely easier because it’s just 3 easy steps. That’s right! You can learn how to make caramel in 3 easy steps, folks. Just follow this recipe that’s so easy, you’ll be finding excuses to make more caramel desserts during the holiday season! 3 Baking Mats, 2 Handy Sizes: Our colorful 3-pack of silicone mats gives you countless options. Use the 2 half-sheet mats to line standard baking trays. Use the 1/4-sheet liner on baking tray in your toaster oven, for small batches and much more. Better Baked Goods: Made with silicone-coated fiberglass mesh, these professional-grade mats provide even heat distribution. You get consistent, delicious results - no burned or undercooked spots! Healthy Low-Cost Alternative: Forget fattening oils, messy sprays & pricey parchment paper. Your non-stick Silchef Mats are reusable over & over. Simply wipe off or pop in the dishwasher (top rack). Melt butter in a medium sauce pan over medium heat. Add brown sugar and stir vigorously with a whisk or wooden spoon as the sugar begins to dissolve. Combine the mixture well. Add cream and bring to a boil. Lower the heat and let the mixture simmer for 5 minutes. Add vanilla and a pinch of sea salt. Stir well until properly mixed. Let the caramel cool in the pan for a few minutes before pouring into a glass mason jar. Store in the refrigerator for up to 2 weeks. Warm in microwave before serving. HIGH QUALITY JARS: This mason jar set is of the highest quality and designed for your convenience. Each jar has a 16 oz capacity and can be used for several different uses. 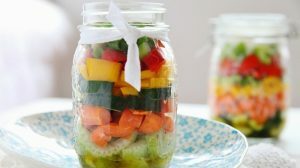 Use the reusable glass jars instead of disposable containers, such as cans that can affect the flavor and freshness of your supplies. CLASSIC AND ELEGANT DESIGN: The Golden Spoon jars have an elegant design. The mason jars have clear, transparent glass. The classic jars come with regular silver lids, so you can use them for storing. PERFECT FOR COCKTAILS AND SMOOTHIES: Drink your daily breakfast smoothie in style with the mason style jars. The glass jars will elevate your drinks and cocktails and will impress your party guests. And that’s it! Making your own caramel sauce is so easy! Make this easy recipe this fall and tell me how you incorporate it in your homemade recipes. Stay tuned for more scrumptious homestead recipes. What do you think of this caramel recipe? Will you give it a try this fall? Let us know in the comments section below.